By: Erik Hyrkas on December 5, 2017. Samsung announced that it is starting mass production of upgraded memory technology today–the first 512GB embedded universal flash storage (eUFS) device made for mobile devices, including smartphones and tablets. The devices are 64-layer 512GB V-NAND chips and have twice the number of cells as Samsung‘s previous controller chips and storage. The UFS devices are said to be supreme in speed, reading up to 860 MB/s and writing at 255MB/s. That’s eight times faster than a microSD card and equivalent to transferring 5GB of HD video to an SSD in six seconds. MicroSD storage seems to be the main target with this innovation, as Samsung suggest embedded storage is more stable and and less limiting than current external storage cards used in mobile devices. With Samsung’s notorious battle with consumers after removing microSD storage from the Samsung Galaxy S6 (and bringing it back in later iterations), this news may suggest Samsung is attempting to remove the need for expandable storage in mobile devices altogether. 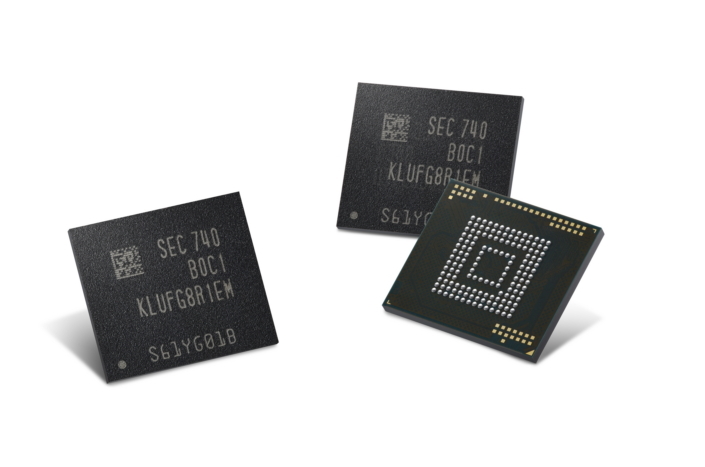 Samsung says it plans to increase the production of all of these flash storage devices in order to increase demand for embedded mobile storage, in addition to its current SSD and memory card products. Any thoughts of your own Samsung’s eUFS innovations? Let us know in the comments.